In the mid-1950s Ribble started renewal of the double deck fleet by buying 120 high bridge PD2s. The 50 purchased in 1955 had Met-Cam bodies and were air braked but for the 1956 batch Ribble reverted to vacuum brakes by buying the PD2/12 model. 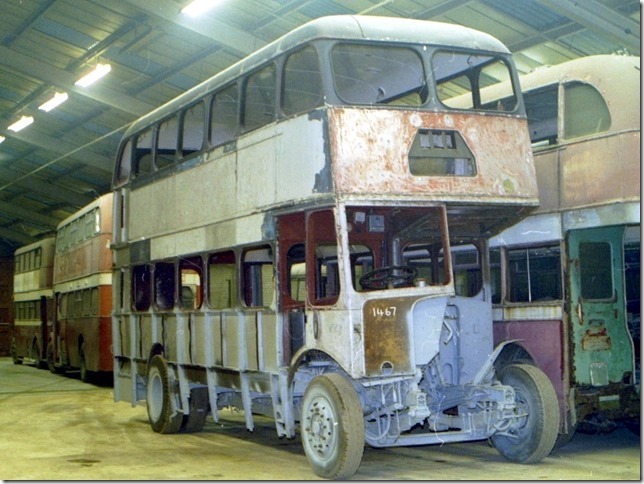 1467 was delivered in August 1956 and was allocated to Ormskirk where it stayed for almost 10 years. It had a brief spell at Preston but by April 1967 it was at Blackpool Talbot Road alongside many similar vehicles. By mid 1971 it was on Merseyside, initially at Liverpool depot, then Bootle. It was withdrawn in 1972 and like many other Ribble buses at the time was sold to Cowley at Salford. By May 1973 it had been purchased by The Northgate Group at Aintree to provide staff transport to their Paula Works which manufactured man made fibres. The company also bought similar 1431. The company later became part of Courtaulds. After being taken out of service in 1980 it was acquired by a preservationist on Merseyside and it was housed at Burscough, home of the Mersey & Calder Group although remaining privately owned. Later it was sold to a RVPG member and moved to our depot. Similar 1455 was already owned by RVPG members but close inspection revealed that 1467 was in better condition and was the preferred candidate for restoration. Initial work was carried out to rectify some problems with the chassis and more recently work has commenced on bodywork renovation. Details and ongoing updates can be found on our blog. It will be some time before restoration is complete but this totally Lancashire bus will be a worthy addition to our fleet.